Below is the next installment in the popular series on Random Acts of Kindness. Each month, a blogger shares the random acts of kindness they have committed with their little ones. You can visit the Random Acts of Kindness page to see previous installments of this series. You can also follow the Random Acts of Kindness Pinterest Board. 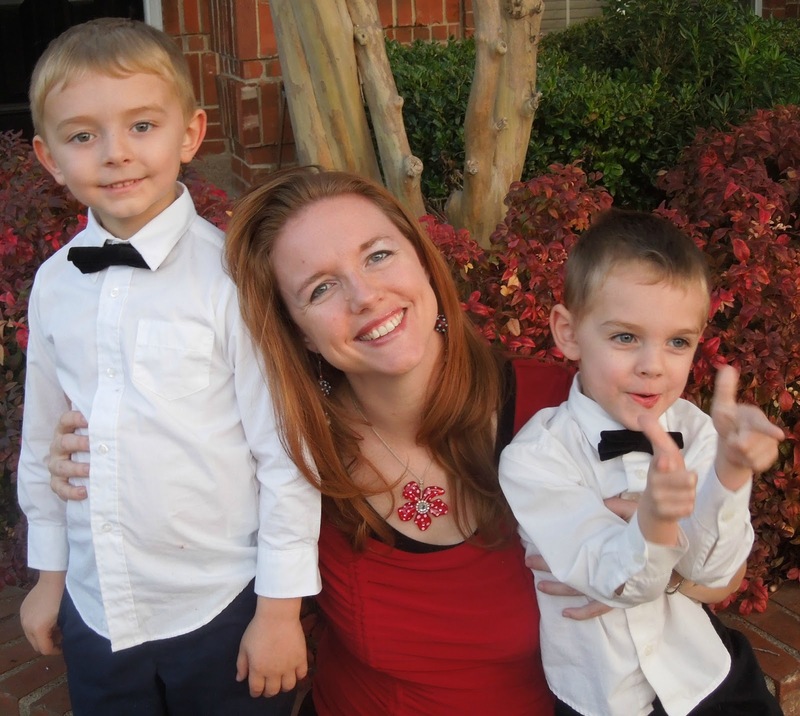 Today’s post comes to us from Sheila at Pennies of Time, who has committed to doing service with her young sons EVERY DAY. 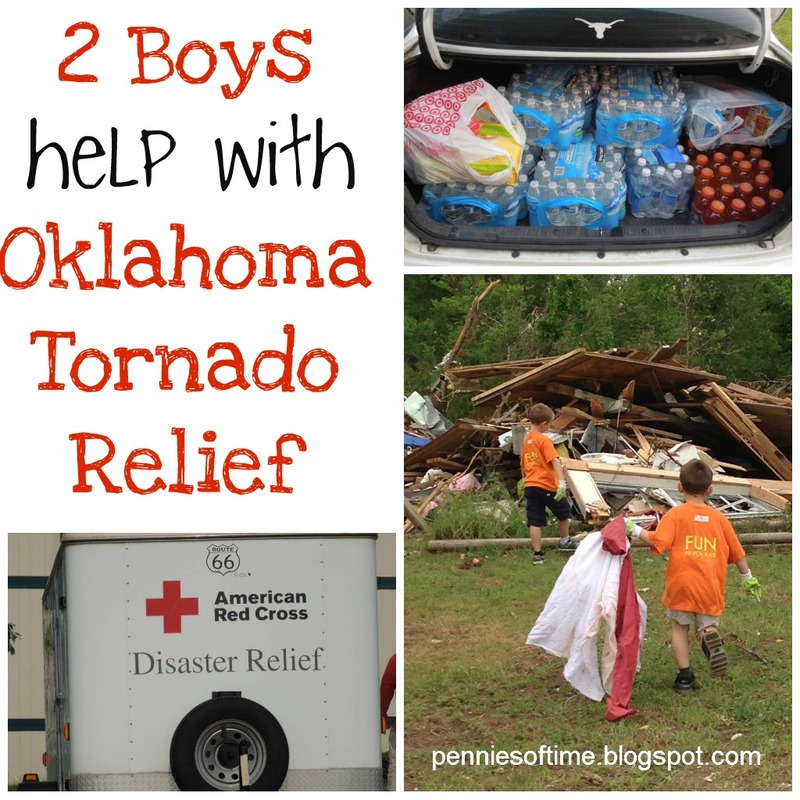 I am so honored to feature the service they did to help with the tornado relief in Oklahoma. Thank you, Sheila, for sharing with us! I have thoroughly enjoyed reading and learning from the previous posts for All Done Monkey’s Random Acts of Kindness Series! I gain so much by seeing how others serve with their children. My boys and I complete an act of service every day. We have been doing this for the past 10 months, and all of us have been thrilled with this type of focus in our home. Usually, we spend 15-20 minutes each day either planning an act of service, completing an act of service, or reading about acts of service. Sometimes, we get so caught up we lose track of time and end up spending longer (those are our favorite times). This particular experience was different than our typical daily acts of service. Our daily acts of service prepared my boys to be successful and ready to help on this day. A day after the tornadoes hit Moore, Oklahoma, we decided that we needed to be active in helping the survivors. We live close enough to go. The boys are hard workers and are comfortable with helping others in need. The boys and I put together First Aid Kits with children in mind. This was fun and also a great preparation activity to teach the boys about some of the things that they would see and hear. We also grabbed the homeless care kits that we made a week earlier. I was sure that someone would need those toiletries. Friday morning, we loaded the car and were off to Oklahoma. We focused our efforts on the areas outside Moore, on those areas that had not received as much support. #1 Listening to survivors tell stories. Oftentimes, the survivors couldn’t even articulate what was needed. We would listen to them tell the story of the disaster, over and over. The survivors needed the chance to process, verbally, what was happening to their lives. My family was the perfect recipient for those stories. The boys listened with intent and offered comedic relief with their little boy antics. #2 Delivering supplies to survivors in hard to reach area. Many people needed water. The hard part was that many roads were closed. Also, in some cases it was hard to know where to go as the street signs were gone. Finding survivors that were without water and supplies ended up being as meaningful as hearing the stories. One older gentleman we found was without water, electricity, AND a vehicle. He also, we discovered, was diabetic. I was so grateful for the snacks that were donated so we had something he could eat. 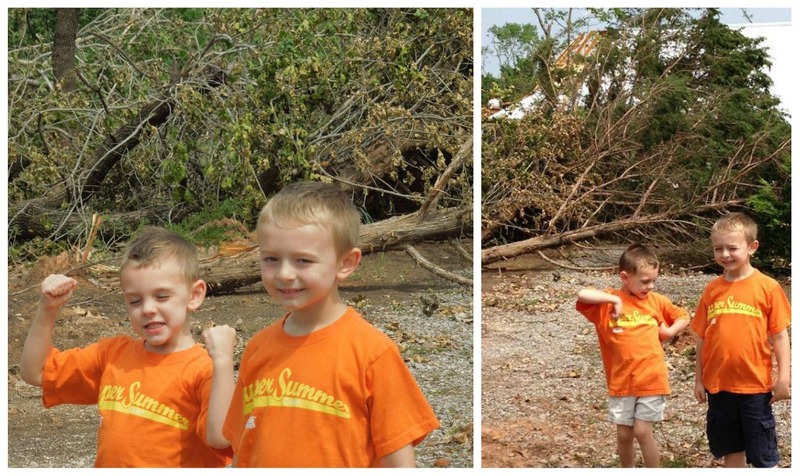 The boys had a chance to see how the devastation also affected families *and* the wildlife in the area. There were so many animals in places that they shouldn’t be, walking around during the time of the day when they should be sleeping, roaming the streets as if they were trying to find their homes, and . . . oh goodness, the dogs. We saw dozens and dozens of dogs roaming around, separated from their families. by delivering supplies and cleaning debris. #3 Cleaning up debris. This is the part that most people gasp in horror at . . . your children helped clean up debris? Yes. We are cautious parents–well, I am a cautious parent. (My husband hugs the other end of the spectrum. Together we balance out.) They wore protective gear and were given tasks that were appropriate for them. And, they worked HARD! Not only were our kids hard working, but the people we were helping were truly touched that little kids wanted to help also. “It warms my heart to know that people are teaching our young generation to think of others and serve,” said a lady who was brought to tears watching our boys clean up her destroyed property. Only 3:30 and we are beat. Distributing supplies and clearing debris . . . doing whatever asked. And, of course, my six year old was caught on camera by a news guy when he donated his own gloves to a little girl so she could help look for lost family photos. My four year old got to ride a tractor. A surprise: the struggle to decide what to keep and toss. One lady just had the hardest time deciding if stuff was worth saving. So may decisions to make during an overwhelming time. One group of guys helped put on a temporary roof support for a home so that the contents inside would be protected from the rain . . . all made with scraps from that same destroyed home. A great experience for our boys. Many people mentioned how it was great to see kids helping. It is amazing to see the caring hearts of all the volunteers that are here. Many drove from far away places, several states over, to come help. We saw: school groups, moms with teens, Boy Scout troops, Veterans, dads sacrificing vacation time and time with their families to help out. Volunteers brought donated supplies like we did. 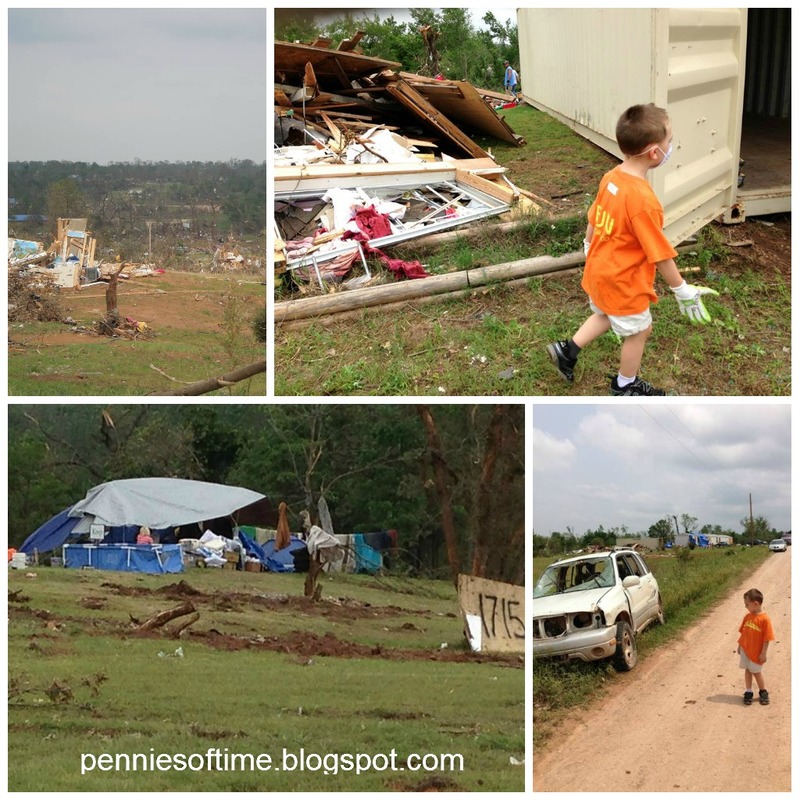 Many brought their trucks, chainsaws, tools, trailers, and other necessary supplies. Watching what willing hearts can do when working together was incredible! We wish we could have stayed longer. They need help, and it is also inspiring to see how others help. If I ever am needed to help in this way again, I would add sunscreen and flashlights to the “need to donate” list. Many people have asked me what they can do to help others when a crisis hits or there is a disaster. Often times, we don’t live near the situation and feel helpless. The following posts were written in response to those questions and I hope you find them helpful. Sheila @ Pennies of Time began her career in education by working with children and continues to serve as an advocate for children that are at-risk. She has taught in a variety of settings from a classroom in small town Texas to a psychiatric unit in Chicago. She is the mother of two young boys and is the voice of Pennies of Time where she shares the adventures of serving with her two young boys. You can see more of what they do on Facebook, Twitter, and and Pinterest. You can see a full schedule of the posts in this series by visiting the main Random Acts of Kindness Challenge page. You can also follow the Random Acts of Kindness Pinterest Board. I agree! It was such an honor for me to be able to share this wonderful post from Sheila. Wow – it is so amazing to see the photos of your kids getting involved and making a difference at such a young age. I agree – so inspiring! Thanks, Jody! It has really helped to shape what they feel is important!